Use the chart below to decide which shade would be recommended. 200" or less 8" - 10"
200" - 250" 10" - 12"
250" - 300" 12" - 14"
350" - 400" 14" - 16"
350" - 400" 16" - 18"
400" - 450" 18" - 20"
450" or greater 20" - 22"
In an open room with 8-9 foot tall ceilings, we recommend the lamp base be about 78 inches over the flooring. If being installed over a table or island, we recommend to leave about 30"-36" of clearance between the lamp and the top of the surface. If being installed in a larger room or entryway we recommend to keep it high, but still within eyesight. Match installation height with the height labeled on top of the chart (Blue section). Match desired shade size on the left portion of the chart (Green section). 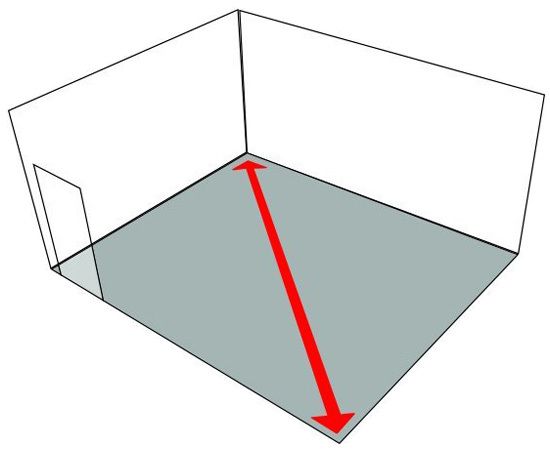 Graph where the two sections meet which will be the radius of the light provided. 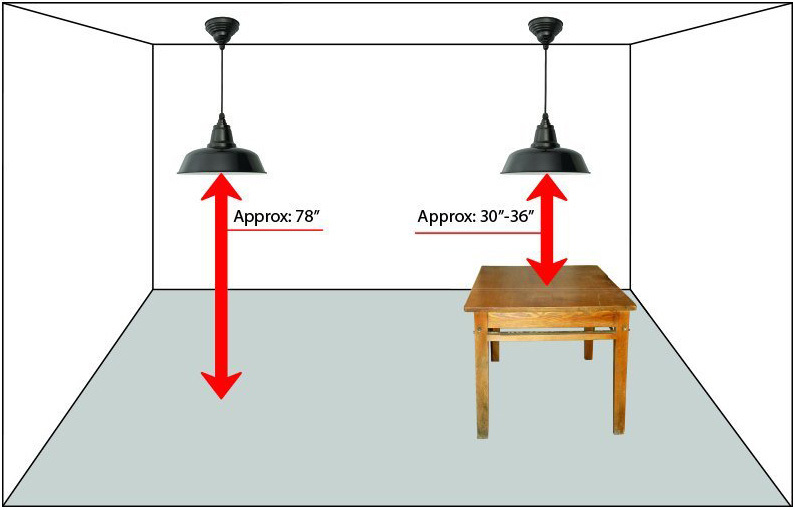 The Barn Light Installation Guide and Sizing Chart is meant to provide you with an easier understanding of how far the light radius will reach depending on the size you have purchased and the height you are planning to install the barn light. Vertically, on the left side of the chart we have our various barn light shade sizes. Horizontally, on the top of the chart we have various heights for installation. For example, if you purchased a Barn Light with an 8” shade and you are planning to install the light 3 ft above the ground and / or nearest surface, then you can expect the actual light rays to reach about a 5 ft radius. Another example, if you purchased a Barn Light with a 14” shade and you want to install it 16 ft above the nearest surface, then you can expect about a 24 ft radius of light. PLEASE NOTE: This chart is meant to be a simple guide to better help understand what to expect on the light radius and is NOT intended to provide EXACT measurements of the actual light rays themselves.